Recife is the fourth largest metropolis in Brazil. The South American city is among the most important ports of the Atlantic. It is a strategically important industrial center. On the territory of the subway, there are about 85, 000 private enterprises. It is located in the Brazilian state of Pernambuco. Recife is a city of beautiful white beaches, palm trees, islands, rivers and canals crossing the metropolis. Recife is located where the Beberibe River meets Capibaribe River, which flow into the infinite blue of the Atlantic. The most famous beach is picturesque Boa Viagem beach. The coastline attracts with its clean sands and green water. Around it is a well-organized infrastructure, including many hotels and restaurants. There are picture perfect views of palm trees around the beach. Recife's nightlife is happening precisely in and around Boa Viagem and in the trendy Gracas. Among the sights of the metropolis is the Santo Antônio Church. The temple is located in the quaint little town of Igarassu, located 45 minutes north of Recife. The spectacular church was built more than 100 years ago. Its interior is also very impressive. In the corridors of the temple are still preserved colorful Portuguese tiles that make up the beautiful interior of the building. The church has a small museum, which has paintings of talented artists from 16, 17 and 18 century. Images are prohibited in the temple. An attraction in Recife is the Basilica of Nossa Senhora de Carmo, considered one of the oldest in Brazil. The temple has an exquisitely crafted gold altar. The church was renovated several times, yet still feels like a Gothic style building. Basilica Square is located in Carmo Square in Recife. The temple is open every morning from 7 to 5:00 pm. On weekends, the church is open to visitors only 11-12 pm Nossa Senhora de Carmo is also the patron of the Brazilian city that celebrates its saint on 16 July each year with lavish celebrations. Sao Pedro Square has the remarkable Cathedral of Saint Peter, built in 1782. Around it, there are many colonial buildings. Among the places to visit are the beautiful building of the Teatro Santa Isabel, located at the Square of the Republic, and Palace of Justice. Other place of interest is the House of Culture. The building was closed, but today it has become a cultural center. Malakoff Tower also attracts the attention of many tourists. The building fulfills the function of an observatory, which houses the Museum of Space Science. To experience the true atmosphere of the Brazilian city, you must visit the market of Saint Joseph. The place dates from 1871 and is considered one of the oldest existing Brazilian shopping centers. The complex has about 550 stores where you can find fish, spices, handicrafts and literature. The area around Recife is one of the first places from which the Portuguese crown began its colonization. Subsequently, the Dutch invaders also left their cultural imprint on the architecture of the Brazilian city. 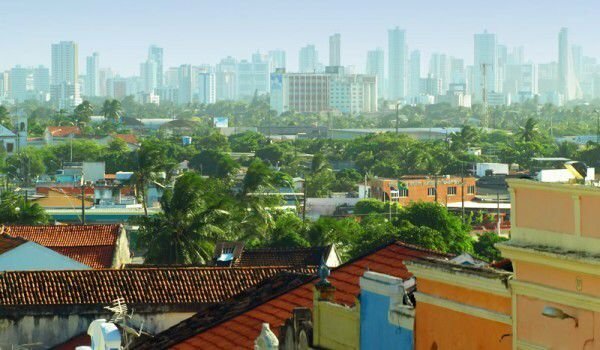 The population of Recife is over 4 million people. This metropolitan area is the fifth most populous in Brazil after Sao Paulo, Rio de Janeiro, Belo Horizonte and Porto Alegre. It is often referred to as the Brazilian Vienna, due to the many rivers, canals and bridges, as well as small one-way streets, crossing Recife. In translation from the Portuguese, its name means “city with coral reefs around the coast”. The city is a major center of the state of Pernambuco. The state has another unique city, declared by UNESCO as a World Heritage site. It's the capital of Pernambuco - Olinda. About 60 kilometers south of the city is one of the most attractive beaches in Brazil - Porto de Galinhas. Recife is the starting point to many other beach towns like Joao Pessoa, Natal and Fortaleza.